If you can't plant the lilac right away, soak the roots as described above, then plant the lilac temporarily in a holding bed. Set the lilac at an angle ("heeled") and entirely pack the roots with soil. Add additional soil and keep the soil moist until you are ready to plant. Choosing the planting site: Avoid planting lilacs along walls or among large trees (or trees that will grow tall). Use complementary shrubs, plants, or other garden outcroppings to enhance the appearance before and after bloom. Space lilacs no less than 6 to 10 feet apart. Crowding requires more frequent and drastic pruning. Sunlight: Make good use of available sunlight; try a south or southwest spot out of the way of doors or windows. Lilacs require a minimum of six hours of direct sunlight daily. The amount of sunlight dictates the appearance, color, and quantity of bloom. Too much sunlight is better than not enough. Drainage: Good drainage is characterized by the soil's ability to retain sufficient moisture to nourish the root system while still being able to drain off excess moisture. 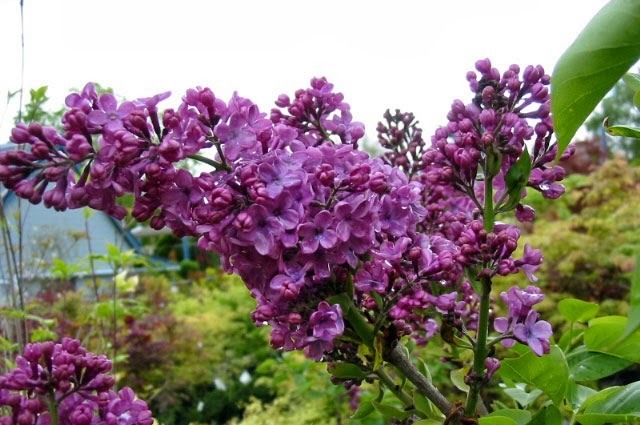 Lilacs do not thrive in soggy soil. Before planting, try digging a hole about 8 inches in diameter by 12 inches deep. Fill the hole with water. If the water has not drained after one hour, improve the drainage or move the plant to another site. Remove the topsoil from the actual planting site (an area equal to 2 to 3 times the lilac's root system) and reserve. Mix the reserved topsoil with peat, vermiculite or other porous amendment to cover the root system when the lilac is planted. The planting hole should be deep and wide enough to accommodate the plant's root system. We recommend adding compost, bonemeal or an all-purpose fertilizer to the planting hole. If your soil is acidic, add some garden lime. When planting, place the top of the root ball level with the surface of the hole. If the lilac is bareroot, the top layer of roots should be a few inches below the surface. When filling in with soil, it is important to water well, but do not flood, and avoid compacting the soil around the root system. The idea is to remove air pockets, yet keep the soil porous. Remember to water your lilacs regularly throughout the summer. During the dry season, water more frequently to keep the leaves robust, not limp. Fertilizer should be applied at the base of the plant early each spring to help provide the plant with nutrients for the coming year. Buds are set the previous year so the fertilizer will feed this year's leaves and next year's bloom. We recommend our Organic Flower Fertilizer. Lilacs love a sweet soil. If your soil is acidic, adding garden lime in the fall will help the soil stay alkaline. Using mulch will help hold water in the soil and reduce heat stress. If you see the leaves getting limp during summer it is a sign that the plant needs to be watered. If you have a repeat-blooming variety, such as Josée, deadheading will will stimulate the production of new flower and leaf buds. All lilac varieties benefit from annual deadheading. Lilacs do not require annual pruning, but cutting off blooms from main stems within a week after blooms have faded will help the plant concentrate on preparing more flower buds and not seeds. If your lilacs become too tall, and the number of blooms declines, you can rejuvenate the plant by cutting one-third of all main stems that have a diameter of at least 1.5 inches. Cut these main stems down to 12 to 15 inches from the soil. This will stimulate the growth of new shoots. Pruning in this way over a three-year period will refresh the plant while it still continues to flower.